Indium Corporation has received the 2006 Frost & Sullivan Global SMT Solder Paste Customer Value Enhancement Award. The award, presented at a ceremony held November 15, 2006 in San Antonio, Texas, USA, is the company�s fourth received from Frost & Sullivan. Previous honors were in 1998 and 2000 for Engineering Customer Focus, and in 2003 for Product Innovation. The Frost & Sullivan Customer Value Enhancement Award is presented to the company that demonstrates outstanding achievement and superior performance in the ability to expand their customer base, while maintaining the existing install base, by using more innovative value creation and enhancement strategies than their competitors. Indium Corporation was chosen to receive the award based on an in-depth analysis of market competitors, as well as interviews with companies that make up the SMT soldering materials industry. Upon presenting the award to Indium Corporation, Deepa Mathew, research analyst, Frost & Sullivan said, "Frost & Sullivan presents the 2006 Global SMT Solder Paste Customer Value Enhancement Award to Indium Corporation, a global supplier of electronics assembly materials with an impressive range of products from solder paste and flux, to high grade Indium. The company focuses on a select customer group who are reputed technology and performance leaders. Its experience with lead-free solder has made it an obvious and safe choice for assemblers who have been refining their assembly processes to conform to the deadline for adhering to RoHS. Ample resources and facilities located around the globe, together with well-qualified groups of personnel and strong field sales staff, help the company win over multinational companies, as well as those that command a strong presence in the local geography. Indium Corporation�s stress on technology and being in constant touch with its customers has provided the company with a definite edge over the competition." Frost & Sullivan's Surface Mount Technologies Research and Consulting practice provides global industry analysis, custom consulting, growth consulting (strategy consulting), and market research & forecasts that are designed to help grow your business. Indium Corporation is a four-time Frost & Sullivan Award-winning supplier of electronics assembly materials, including solder pastes, solder preforms, fluxes, Pb-Free solder alloys, underfill materials, die-attach materials, polymers, and more. The company is also the world�s premiere supplier of commercial grade and high-purity indium. Factories are located in the USA, the United Kingdom, Singapore, and China. Founded in 1934, the company is ISO 9001 registered. 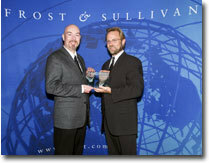 For more information about Frost & Sullivan visit www.frost.com. For more information about Indium Corporation visit www.indium.com or email askus@indium.com.